If you haven't yet had the pleasure of meeting Don Tillman and his lady love Rosie, be sure to check out my recommendation for The Rosie Project, the first book in the series. Lovably awkward professor Don Tillman is back in this sequel to the charming and hilarious novel The Rosie Project, and I for one am so, so glad of his return. Sophomore novels are risky by nature, especially when they follow commercially successful debuts, especially especially when they continue the story of a beloved character. Sometimes the author can't quite manage to recapture the magic, the mysterious essence that made the first volume so delightful. 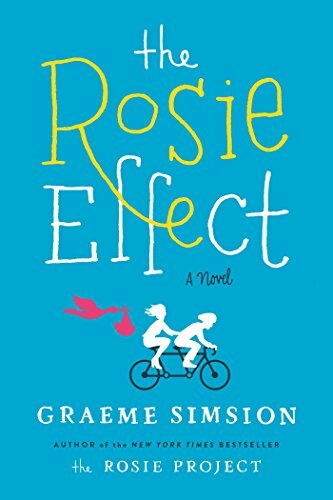 Fortunately, Graeme Simsion avoids all the potential pitfalls and delivers a new story that is just as sweet and fun to read as the original. Don and Rosie, now married and residing in New York, are living busy lives. Rosie is a medical student and PhD candidate, while Don continues his work in genetics at Columbia. For the most part, Don has made the necessary adjustments to accommodate Rosie into his life: he has dispensed with his regimented meal plan and accepted that Rosie's tendency towards disorganization leads to an increase in household clutter. However, he's about to be thrown for a major loop. Rosie is pregnant. Don has serious doubts about his ability to be a father. He knows Rosie should avoid stress, so he does his best to hide his fears from her, but it seems she draws further away from him by the day. Don begins to realize that he may not be cut out for fatherhood, and that his failure to fulfill his role as parent could lead to the end of his marriage. As you'd expect after reading The Rosie Project, Don's social quirks lead to a series of pratfalls, this time with near disastrous consequences. From a confrontation with a social worker over sustainable seafood, to an airline employee identifying him as a terrorist, to his arrest at a playground after assaulting an officer, Don has plenty of challenges to overcome. But his biggest challenge yet will be convincing Rosie—and himself—that he is father material after all. Don is one of the most endearing and haplessly comic characters in recent memory. If you enjoyed The Rosie Project and his bumpy road to finding love, don't fear the sophomore slump—you'll love The Rosie Effect just as much. With regards to NetGalley and Simon & Schuster for the advance copy. On sale December 30. Newer:All the Light We Cannot See by Anthony DoerrOlder:LiterScary Challenge #4: "Not With a Bang But a Whimper"